Outdoor parties can be a hit, especially during fine weather when your guests can bask in the sun or dance under the stars on a clear summer night. Outdoor parties are fun, different and memorable. To pull one however, you need to plan carefully and ensure that you have the right infrastructure in place. In this article, we give you a checklist of things to tick off as you plan your next out door party. It goes without saying that rain and snow don’t go well with outdoor parties. But even beyond the obvious, there are some other less obvious areas that you need to watch out for. For example, having an outdoor party on a moonlit night can be magical if you minimize the artificial lighting and allow for some of the areas to be lit by the moon. On dark nights, you might want to increase the amount of artificial lighting so that there are no dark spaces. Remember to alert your guests about the nature of the party so they come dressed appropriately. You don’t want your guests shivering outside on a chilly night because they came dressed for an indoor party. Foods and drinks are the life and soul of a party. Ensure that the guests always have a constant supply of foods and drinks. Depending on the number of guests, you can use the help of your family members to serve the refreshments. For larger parties, consider getting hired help ranging from professional wait staff to recruiting a few young people from your neighbourhood to help out. Having an outdoor kitchen and bar would come in handy in ensuring that the food and drinks are within reach of your guests. While setting up an outdoor kitchen and bar might seem like a sizable investment, it will add sizzle to your outdoor parties and enhance the beauty of your house. There are many professional contractors that can help you install your outdoor kitchen and bar in Toronto and it is worth having a look at what they have to offer. This is an essential ingredient to any party. Ensure that in the selection of your play list, you have thought through the tastes and likes of your friends. This means that if you are into off-the-beaten-track kind of music, remember that your guests might not and so go with music that is a little more mainstream. This goes for entertainment as well. If you are hosting a children party for example, a clown act might be far more appropriate for such a setting while the same might look a little odd for an adult party. Keep in mind that most cities have laws on noise and ensure that you comply with the law on this. The last thing you want is the police showing up to shut down your party because you are making too much noise for your neighbours. Outdoor parties can be incredible fun. Having the right infrastructure in place will make it much easier to host such parties. In this sense then, investing in an outdoor kitchen and bar is something you should seriously consider. Thinking about entertainment, food and the weather in advance will also go a long way in making your party really fun! What Can You Convert Your Shed Into? Doing what you love in your spare time is very relaxing. And one way to do it is to have a place which you can call your own. 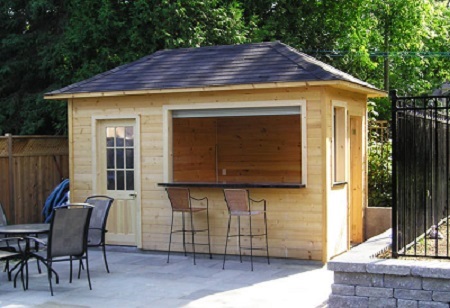 If your home does not offer enough space, a shed is a very practical solution. You can do your hobby in your shed without being disturbed plus it will also serve as a stashing area for your items when you are done. Only a small corner will be needed for this. Just tidy it up, drape its walls with cloth and throw some cushions on the floor to create a Moroccan effect. This would be a great hiding place when you want to be on your own and clam up in your niche. 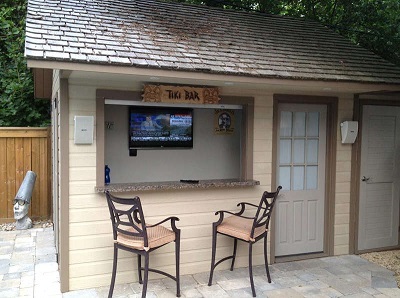 If your home is not spacious enough to entertain friends who are in a drinking mood, make use of your shed. Just a few adjustments will do the trick. Play with the lights to suit everyone. Bring in sofas, high stools and a radio. Don’t forget to bring in the drinks and ice bucket for that perfect night with friends and loved ones. A shed that is insulated and lined with shelves is perfect for stashing books and other reading items. This can function as your mini library. To make you more comfortable, you may want to bring in a cosy chair or a couch into the space. Just remember to use proper lightings so you will not have a hard time using it for this particular purpose. Not just any shed will be suited for this purpose because unlike humans, pets may not be able to get out if the environment gets uncomfortable for them. It should have windows to provide proper ventilation without allowing water to come in during rough days. See to it that it is safe for your pet as you leave him during the day. It is also a good recovery area for sick pets. 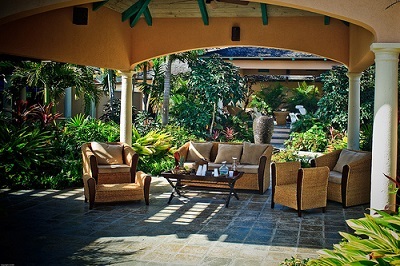 This can be a perfect dancing area with your friends for the weekend without going out of town and spending a fortune. Just push the furniture aside and bring in the materials needed for the party. It provides privacy as you dance your hearts out to any music that suits you – a salsa, hiphop or whatever. After which, you may take a breather in the garden to get a sniff of fresh air. Your shed is a perfect place to generate power by installing solar panels to be used for charging small batteries. This allows you to save on electrical consumption. You may opt to make your own electric motor and some fan blades or you may just purchase a turbine kit. Sheds have many different functions that you and the rest of your household will love. It is a perfect place where you can escape from stressful days and from the usual grind in your home or in your workplace. 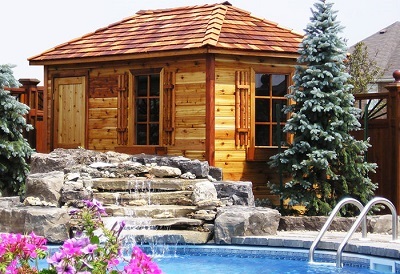 If you are looking for ideas on pool sheds and cabanas then why not start browsing our pages? Get an idea on how you can make a shed work for whatever function you have in mind. Give us a call if you have queries regarding these structures! Modern swimming pools usually incorporate a cabana in its physical setup because of its function to serve as a shelter and a lounging area for swimmers. Aside from that, it also beautifies the overall appearance of the pool site. To some, it can even be a venue for small gatherings. Depending on its function, pool cabanas should be decorated accordingly. Decorating cabanas for special events entails creativity that would match the occasion without disrupting its poolside theme. For daily use, simple use of your imagination plus the usage of on hand materials will be enough. Here are some tips to make your cabana look pleasant without splurging. Your budget plays a great role in decorating your cabana. Before you start purchasing the necessary materials, do some research as to the prices for items you need. You can do this on the internet. Avoid purchasing single items that are too costly because this will definitely ruin your budget. You would not want your cabana to be half done. You can do this on your own or if your budget allows it, you may ask the help of experts. There are many styles to choose from. You may opt for an old-fashioned or an ultra-modern look. For a traditional appeal, make use of dark wood and for a modern twist, you can consider having brushed or stainless steel. Regardless of its style, it should be able to contain basic amenities and a section that provides privacy. A simple painting job will instantly give your cabana a lift. Before doing it, check for damages on its walls particularly if it is made of wood. Select a colour that matches the surroundings and even its canopy. The rule of thumb here is to make everything complement each other. Adorn your cabana to suit your personal taste. Have some embellishments customised to create a unique look. 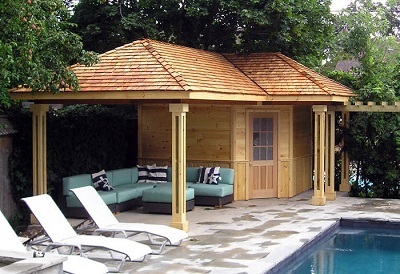 Making use of carved wood especially designed with your specifications will allow you to have a one-of-a-kind cabana. Same holds true for steel that are moulded according to your liking. Remember that there are a lot of choices in decorating. Lights that are properly placed can dramatically change the ambiance of any structure and this includes a cabana. Fairy lights can be coiled around the posts to make up the frame of this structure. Placing yellow-shaded lights at a low level can create a mellow ambiance. Install larger lights attached to other points to make its surroundings bright. It is optional to switch it on or off as this will depend on your mood or the event as the case may be. Free-flowing fabric either as curtains or accents can soften the look of a cabana. Just see to it that it does not cut off the overall appearance by hanging fabrics that end halfway. Remember that these should sway with the breeze as its hems touch the floors. If you decide on having wood as the prime component of the structure, furniture pieces should also be made of wood. Steel finishing also require furniture that have more of this material. The bottom line herein is to suit a furniture piece that goes well with the pool cabana. It does not necessarily mean choosing the same material for the furniture and that of the structure but rather look for pieces that complement each other. Looking for different design styles for pool cabanas in Toronto? You can browse through our pages or give us a call if you are interested in our services. What’s Hot In The World Of Pergola Designs? A pergola does not need to be a boring structure in your garden. With its function to provide a shady path or sitting area in your garden, you can double its purpose by making it a striking feature or a highlight within that space of yours. You don’t have to settle with vines alone to make it look inviting. Be it an extension of a building, a link between pavilions or a free standing pergola, you can do a lot of things to make it an interesting garden feature. But before you start to give an old pergola a makeover or if you are planning to have one, read on and know what is ‘in’. Here are ideas on the latest designs and features for these outdoor structures. Traditional pergolas used wooden slabs and panels for roofs. Today, adjustable roof panels are now available even in DIY marts. This is essential in controlling the amount of sunlight you get. 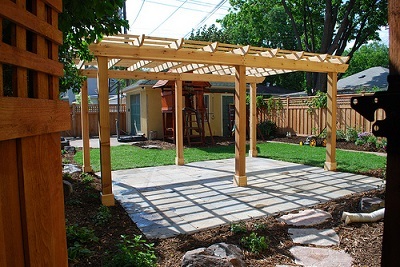 A good idea to build a pergola is to wrap it around a sturdy tree. This will not only serve as a post but will provide a good shade especially during the summer season. Its blooms will be useful in adorning the roof of your pergola. Another option is to have a tree for a backdrop. 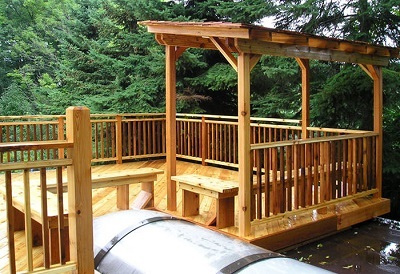 Timbre, especially cedar or redwood are perfect for gardens. These colours will blend well with nature and could match with other items. It will add more to that woody ambiance thus promoting a more relaxed feeling. A pergola can be beautiful on its own but its appearance can be accentuated by incorporating its structure with a patio or deck. Both structures can benefit if this is the case. When placed strategically, a patio or a deck can serve as a ‘traffic zone’ for the seating area. Ideally, a pergola has four open sides but you can opt to have two open sides only with the two adorned with trellises. Just see to it that the plants woven to it blend well with the landscaping and with the rest of the garden greens. A good way to uplift a dull looking pergola is to hang lightweight fabrics that extend from its beams to the floorings. It should be on an light shade that matches the colour of the cushions or sofas. To stay on the safe side, opt for a semi-transparent white cloth. As for more advanced designs, this architectural structure plays with multiple ceiling heights and with bolder columns. Much emphasis is given to the roof as this is has a great impact on the overall appearance of the structure. For those who want to make a change, have your pergola constructed apart from the traditional square or rectangular design. Have it in a concave style. This can be made either from wood or stainless steel metal. If budget is not a concern, a small swimming pool in the middle or in a corner can be a highlight. To give warmth on cold evenings, a fireplace can be built but its colour should not deviate from the main theme. This does not only make you feel warm but will also be an attractive piece to adorn your pergola. As you have seen, there are a lot of great things you can add to the traditional-looking pergola. If you want, you can check our gallery of custom outdoor structures to have an idea of what you want for this architectural inclusion that will enhance your outdoors. Should I Have A Pool Cabana In My Backyard? We all love pool parties, don’t we? If you have a pool at home, you certainly know how such parties are enjoyable. The turnout is normally very high because everyone wants to have fun by the pool side. Are you organizing a birthday pool party for your husband? Then a cabana is all what you need. You would wish to entertain your friends, but you don’t want them to have to go back to your house to change into their swimming costumes. That can be very inconveniencing, right? A cabana will limit your guests only to the pool area. They will use the washrooms there instead of the ones in your house. A cabana is also a place where guests can change into their swimwear and so there will be no traffic in your home. You will also have plenty of space to serve them with food and drinks. Additionally, you will not need to monitor your guests because they will all be in one place. Isn’t that what you want? Have a cabana constructed. Just like a basement, a cabana can be a perfect area to store your items when it is not in use. This is especially during winter when it is extremely cold. It is an ideal place to keep all the toys your kids use to play with when they are in the pool. You can also store the chemicals which are normally used to clean the pool. Do you have extra deck chairs and tables? Store them in the cabana. Store anything else there that is not needed in the house. When summer comes you will only need to arrange them in the cabana as opposed to moving them from the house. Create a large playing area for your kids in your house by keeping some of the unused items in the cabana. Where else a pool in a backyard increases the value of a home in the real estate sector, a pool cabana increases it even higher. If you are planning to sell your home in the future, then you should definitely have a cabana. The real estate market is very competitive and you need to have a better strategy if you want to get a good price for your home. If you sell it with the cabana, you will make more money. The cabana will attract more potential buyers and they will all be competing for your house. It could even result into a bidding completion where the highest bidder gets the house. A buyer can even offer double the amount of what you are asking for just to purchase the property. Apart from just swimming for pleasure in a pool, people also exercise in water. A cabana can be the perfect area where you can have fitness equipment. By doing so, you will have a private gym in your house. The equipment doesn’t have to occupy all the space in your home, you can have specific time set only for exercising. Moreover, you can enjoy the cabana throughout the year. Cabanas come in a wide variety of styles and designs and so you can choose one among the many. You don’t have to plan the design yourself because there are professional companies which specialize in the construction of cabanas. You can inform the experts what you want your cabana to look like and then leave them to install it for you. You can even ask them to install a hot tub in the cabana for more comfort. A kitchen, a bathroom and a changing are all standard inclusions, but you can choose whichever design you want. Whichever idea you have, it can be transformed into reality. There is no limit to creativity when it comes to the cabanas and you can help the professionals create your dream pool cabana. There are many more benefits of having pool cabanas. The ones explained above are just some of them. Give your home a new look by having a pool cabana in Toronto. You will never regret having made this decision! People these days are no longer afraid of playing with colours for almost anything that they have built. Now, you can choose to have a colourful porch that highlights greens depicting that of nature. You can add vibrant hues inside the porch and use some asymmetrical designs for your throw pillows. You may also opt to paint piece of furniture with nature-inspired colours to bring in that beach vibe into the outdoor structure. The beach is a perfect getaway for couples who want to have a romantic day together. Choose to have a second-floor porch in your home so it will be easier to keep things private between you and your partner even when the bright lights of the sun are up. Use solid railings and overhanging eaves to make the entire idea more perfect. Bring in some cosy, dark-coloured furniture pieces in the area to make it more romantic. Make sure though that the cushions go more on the lighter colour. The beach is often associated with the tropical theme and what better way to have a beach-inspired outdoor theme than to have a tropical porch designed for you. Turn your casual gatherings into an alfresco setting with a porch that comes with louvered doors that seem to open to a better view of your garden or your swimming pool. Since a tropical porch typically is mostly made of wooden materials, you can add a soft touch to it by using some canvas curtains for more privacy within the area. You can accentuate the whole area with furniture pieces or pillows that come in a blue colour hue for added beach-inspired effect. If you want to enjoy the beach even more, you will certainly love the idea of a fish prep station in the outdoors where you can cook the freshest catch for the day. You can choose to have it designed right into your garage. Save some space for your very own fish grilling station too just in case you feel like eating your fish hot off the grill. You can use that small area in your porch to have a tucked-in kitchen where you can cook food whilst dining out with friends and loved ones. Designing this are using white colours will bring in that beach atmosphere into the addition. Paint everything white and add some touch of wooden furniture pieces to the idea. You can also include a charcoal grill in that cosy space of yours. The beach is always associated with the sun thus it will be a good idea to have an outdoor space with a sunroom if you feel like bringing in the beach right into your own home. You can have a sunroom attached into your home and enjoy your very own breathtaking sceneries in your garden even with the most adverse weather outside. You can opt to have some sides of the structure open too so you can breathe in some fresh air if you want. Some Asian countries like Thailand and Indonesia are best known for their beaches thus if you want a real feel of the beach, why not incorporate an Asian-themed design into your pergola? You can have a comfortable seating area in your pergola and plant some vines so that when these plants grow, you will be able to enjoy your very own canopy that seems to be growing out of nowhere. Yes the vines will be able to create that canopy for you. You can also draw inspiration from the beaches in Bermuda and the Mediterranean. If you want to have that breathy, comfortable of the outdoors similar to what you experience when you visit the beaches around town, you can build an open-air pavilion near your pool area. You can use the same place when you want to entertain guests at night time or even if you want to take time out from the scorching heat of the sun during pool parties. You can mix and match colours in the area but it will be best to have some blues and whites all around. You can put in wooden lounging chairs into the pavilion then add a porthole-style window just near the pavilion’s roof. Canvas curtains can be used in it too. Try browsing through our pool sheds and cabanas and see which one amongst our designs will spark up the perfect beach inspiration for your home. Feel free to consult us for any designs that you have in mind as we are able to customise the outdoor structures you desire for your outdoor living space. What Are The Different Structures That Work Well In Any Outdoor Space? Have you always wanted to add an outdoor structure to your existing exterior living space? Well if you have that in mind then you have to understand very well which type of structure will fit into that space of yours. There are plenty of them you can enjoy and whilst you think every outdoor structure is the same but differ in terms of purpose they serve, you have to realise that there are other differences to take note of. Before digging deeper into the different types of outdoor structures available for you to choose from, let us have an overview of what outdoor structures are. These multi-functional structures must feature a lot of things, the most notable of which is how it will protect you from weather elements considering that it has to go through all those as it stands there in your outdoor living space. Also, they are something that should offer you comfort when you feel the stresses of daily living. They should also be able to define that space of yours so you can have a better way to enjoy the outdoors. What makes these outdoor structures highly favourable for many is the fact that you can already have them customised according to your purpose. There are even structures that can now be used in more ways than you can imagine. With that, let us get to know each outdoor structure even better. Pergolas are often confused with other outdoor structures like the trellis or arbour but the truth is it can be different from the other two. These are free-standing structures that have columns or posts used to basically support the trelliswork’s open roof. In order to accentuate your pergolas, you can train plants and vines allowing them to climb on the structure for that rustic, mesmerising charm. Likewise, you can add a canopy for added protection from the weather outside. If you want your pergolas to look more romantic and private, you can consider adding pergola curtains. Another structure to add to your outdoor living space is the trellis. Trellises, like pergolas, are designed with an open framework and come with a lattice where climbing plants can be placed to beautify the structure. You can choose trellises made out of wood or metal or vinyl. Some trellises can be free-standing whilst others can be attached to your home depending on your choice. You can make use of them too if you need extra room but there is not enough in your home. Arbours, the other type of structure often mistaken as a pergola, are actually smaller than trellises or even pergolas for that matter. They are actually used in dividing various outdoor rooms or for framing a focal point in your backyard or garden. They can also define a point of entry to your home. Often, arbours are made out of rustic lattice or metal where plants like vines or even roses can climb. If you want a more solid outdoor structure, patio covers are the perfect choices you can make. They are often built with lattice or trellis and also have a solid roof on them. Patio covers are great choices for you to enjoy the outdoors all-year round. They can serve as a space where you can welcome your guests or where you and the rest of the family can dine out anytime you want. These octagonal structures also come with a solid roof like those of patio covers. They provide you with a full shade whilst you enjoy the views from the outdoors. They are perfect additions if you have either French or an English inspired garden. You and your family, neighbours or friends can enjoy an intimate get together and at the same time have a breathtaking view of nature when using a gazebo. These gazebos can be flexible choices too since you can add o hot tub in the area or even put on some screens to guard you from insects. If you want something to compliment your pool area then cabanas are great additions to your outdoor living space. These covered areas bring in a breath of fresh hair during those warm summer days. Some come with outdoor drapes thus allowing you to use the structure as a changing area after you have taken a plunge from the pool. Enjoy your snacks in the cabana’s lounging area or have some time to relax after a day’s dip in the swimming pool. You can also use it for entertainment purposes. These are but some of the few choices you have when it comes to outdoor structures for your outdoor living space. It is good to note that no matter how varied they are from each other, you can now have custom outdoor structures to meet your needs. Feel free to contact us for such options! Pool cabanas are built for several purposes. With these purposes in mind, you have to take extra time planning how yours will be built. Remember that the aesthetical aspect should work hand-in-hand with the function. Since the pool cabana is usually a place for more people, you have to consider how it will benefit or serve them as well. These being said, you have to be familiar with some tips to consider when building pool cabanas in Toronto. When you are thinking of the location of your pool cabana, of course, the obvious choice is somewhere near your pool, preferably the pool side. Others will rather describe the location as somewhere that will highlight the pool. Alongside these careful considerations in terms of the pool cabana’s location, you have to make sure it will be situated in a spot where sunlight will be maximized. You can also decide as to whether it should be placed on the center or on the front or just allow it to work well with your landscape. There are also other factors to consider. For one, you have to decide whether you will need electricity in order to enjoy your cabana or not. In another, you have to check it has to be plumbed with your outdoor shower, toilet or bar sink. It will also be wise to make careful decisions that will make the pool cabana look good on the location you have chosen in all four seasons of the year. Remember that weather and the surrounding foliage can be greatly varied during these seasons. All of these have some bearing or impact to building your pool cabanas. Apart from choosing the right location with which to build your pool cabana, you also have to consider the size that will fit that location you have allotted for the structure. Size have to relatively work with the location such that both factors should meet the comfort that you want once the cabana has been built. Take note too that the size should not overwhelm your landscape or backdrop. Let the size work harmoniously with everything found in your outdoors. Whilst you think you have already carefully thought of the size and location for your pool cabana, you also have to take into consideration some factors that are out of your control. Remember that Toronto’s local zoning and permit requirements matter so it is good to check such requirements from your local zoning centre or from your municipality. You will not want deviating from standards required in your locality that is why it is best to be familiar with such regulations. Some restrictions here and there may apply when building pool cabanas and you better be aware of them too. Most pool cabanas are built over concrete foundation. Since most people having these structures built already have concreted on their pools, it will be a great idea to have an additional concrete pad poured over the area. You can also choose to use patio or crushed stones for the base. Regardless what choice you make, you have to make sure that it will work well with your drainage. One of the things to consider for your pool cabana’s interior design is whether to put some partitions on it or just keep the space open. You can even add some serving windows or a bi-fold bar into the area. You can use much help from benches or shelving to make it look cosier and feel homier for you, your family and your guests. Whilst you have given careful thought for your cabana’s interior, you should also pay some attention on giving it some finishing touches on its exterior. Remember, if there is anything else that your guest will first see whilst walking towards your cabana, that will be its exteriors. In this regard, you have to think of what else to add apart from your existing landscape along the pool area. You can have trellises draped with vines or add flowers and shrubs around it. When you are designing to build a pool cabana, you will need the help of experts. They can customise your cabana according to your needs and requirements. They can even do bulk of the job for you including those that have been mentioned above if you wish to. 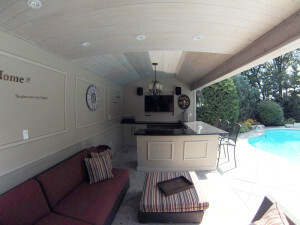 Looking for builders to help you with pool cabanas in Toronto? Browse through our pages and look for that design that you have always wanted. If you want customised pool cabanas, you can also discuss your preferred choice with us. Together, we can build that outdoor structure perfectly and make it work to serve all your needs. If you already have a swimming pool in your home or business premises, chances are that you are thinking of installing pool sheds and cabanas as well. These are usually very important in increasing the usefulness of the poo. They provide a place where the people using the pool can relax. In addition to that, you can also use them for other functions including as storage facilities. After you have decided on the type of pool shed or cabana you want to install, you will then need to make up your mind on the materials you will use to achieve this. In such cases, you should consider going out of your way to use recycled material to get the results you desire. The fact that many people around the world are now focused on saving the environment means that it will be easy for you to identify many manufacturing plants that can provide recycled materials that you can use for the construction. For instance, there are some firms that can use old plastic bottles, turn them into chips and then convert them into building materials. Well, the fact that such projects are now being carried out in large scale means that it’s now easy for most people to gain access to recycled building materials with ease. In the past, you had to pay more for them, which discouraged people from using them. The way in which you design the pool sheds and cabanas can also have an influence on how the entire structure will affect the environment in the long term. For instance, by simply aligning the pool house in the same orientation as the path of the sun across the sky, you can reduce the degree by which the interior of the cabana will be heated. This in turn means that you will need to spend less on cooling the facility during the warmer months. Smart design will also help you save the environment in the short term. By thoroughly thinking through the decisions you make, you can reduce the amount of material used in the construction process. This will not only be cheaper for you, but also good for the environment. Most people avoid using high quality contractors on the basis of their cost. However, not all of them are that expensive. Even if they are a bit more expensive compared to other types of contractors, you will find that the benefits of using them will far outweigh the initial cost particularly in the long term. In the end, they will be worth working with. Employing current technology during the design and construction of the pool houses and cabanas can also help with environmental conservation. For instance, you could use 3D modeling software to design the pool house so that the wastage of resources is limited. Using accurate design techniques also increases the chances of the project proceeding at a fast rate as well. In summary, there is a lot you can do to reduce the environmental impact that your construction will have. The most important thing to remember is that the team you work with will play a central role in determining how this will play out. When you work with a high quality team that shares your passion for the environment, they are likely to augment any strategies you use towards saving the environment. When you are interested in building a custom pool cabana for your home, one of the issues you have to settle is how to do the lighting. It might seem trivial, but it’s actually important for you to give this enough thought. The reason is that the lighting can often be used to enhance the beauty of the cabana, and to also make it more practical. Once you have decided to construct the pool cabana, the first thing you need to do to get lighting ideas is by getting the right inspiration. Easier access to information in this day and age has made this very easy. If you are working with a contractor to do the installation, you can go through their portfolios to get an idea of some of the lighting methods you can use in the facility. If you are working with a high quality contractor, getting this information will be very easy since they are likely to have handled many projects of this kind in the past. In addition to that, you can also look for inspiration in websites and blogs that have something to do with pool house design as well. These are relatively easy to find as long as you have a basic knowledge of how to use a search engine. Social media sites are also good sources of inspiration as well. Once you have decided on a particular design, you will then need to go through the process of choosing the lighting to use in the cabana. Ideally, you should get a type of lighting that has been designed for use in the outdoors, and specifically in an area with a lot of water. These are usually waterproof, and can withstand splashing and raining on a regular basis. When choosing the lighting, you also need to consider what you will need from it. For instance, if you are the type of person who usually hosts poolside parties at night, you might need the lights to be as practical as they are decorative. You will need them to produce enough light to make it easier to use the pool at night. This might mean modifying the placement and the number of lights you choose to use so as to achieve this effect. It’s extremely important that you have the lights properly installed. This is important because it reduces the risk of accidents related to the use of lighting in wet environments. For instance, some low quality contractors might leave a few of the lighting wires naked, and this could then lead to an increased risk of electrocution if the cables came into contact with water from the pool. The same can also happen if it rains. There are many quality control issues that need to be addressed when installing lights particularly for outdoor use. In fact, in some parts of the world, there will be regulations regarding how this should be done for the safety of the people using the lighting. When you are installing the lighting, you should consider making use of such guidelines or laws as your yardstick for measuring how well you are doing it. If you consult a high quality contractor, you can be sure that this won’t be something for you to worry about, since most of them have very high standards regarding the quality of their work. A common theme among most people these days is how to conserve the environment by reducing the amount of energy you use. When it comes to lighting your pool cabana, you can achieve this by making sure that you use the minimum number of lights needed. This depends on how well you do the design. When the design of the cabana is accurate, it’s going to be easier to determine how many lights you need to properly light it up. In addition to that, you can also make use of the more obvious strategies such as installing energy saving bulbs in your lighting fixtures. These days, you can even get the LED lamps, which consume a small fraction of the energy that an incandescent light has. 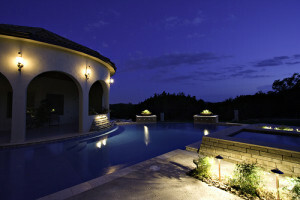 Finally, you could also get new technologies such as motion sensing lights in some parts of the custom pool cabana. These are designed to switch off the lights when no activity is detected in a particular area, which helps you save energy even if you forget to switch off the lights when you leave. Copyright © 2016 Cedar Wood Structures Inc. All rights reserved.